We understand that every accident is unique, but we also understand the hardships that you are going through. 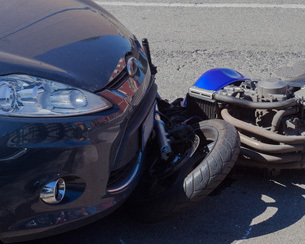 Motorcycle accident injuries are often devastating. Many motorcyclists involved in serious crashes are either inflicted with injuries that they will deal with for the rest of their lives, or they are killed. At Carluzzo Rochkind & Smith, P.C., we represent victims and victims’ families in personal injury cases and wrongful death cases that stem from crashes in Manassas, Prince William, Manassas Park, Gainesville, Haymarket, Woodbridge, Lake Ridge, Dumfries, Bristow, Warrenton, Centreville, Fairfax, Stafford, Chantilly, Leesburg, Ashburn, Sterling, Herndon, Reston, Alexandria, Annandale, Arlington, and throughout Northern Virginia. Our motorcycle accident attorneys in Manassas don’t back down from challenging cases and tough legal battles. We’ll fight for you if your crash was caused by someone else’s negligence. Who Can We Sue For Damages And Compensation? There are several possible negligent parties in a motorcycle crash case. Our firm will perform an independent investigation that includes interviewing witnesses and reconstructing the accident scene to gain the clearest, most comprehensive perspective of the incident. Possible negligent parties include drunk drivers, distracted drivers, inattentive drivers, aggressive/reckless drivers, fatigued drivers, motorcycle manufacturers, bike part manufacturers, repair shops and governments responsible for road maintenance or construction. We begin with a conversation about your immediate and long-term needs and hardships. Then, we get straight to work on investigating your accident, the police report, your medical care, the driving history of the driver who hit you or caused you to crash, any possible road defects, bike part failures and anything else that could lend clues to the cause of your crash. We are a team of trial lawyers, and you have access to the full resources of our firm as our client. We take on all of the legal burdens and costs of litigation. Our lawyers handle all communications with insurance companies and adverse parties. Your case for maximum compensation will be built from the ground up with precision, and we will hold the responsible party accountable whether you were run off the road, sideswiped, T-boned or had a bike malfunction. We’re here for you and ready to go to work. Discover your full legal options and what makes our firm the top choice today. Please contact us through email, or call our office at 703-361-0776 for quick response and to schedule a free initial consultation. We handle all motorcycle accident cases on a contingency fee basis, and we look forward to speaking with you about your unique situation.